You know, the ones that boldly declare that the eggs sitting cozily inside their carton are from chickens fed an “all-natural vegetarian” diet. At first glance, that sounds pretty good, right? I mean, it’s always good to pay attention to labels–especially with all the “iffy” stuff that takes place in food production these days. 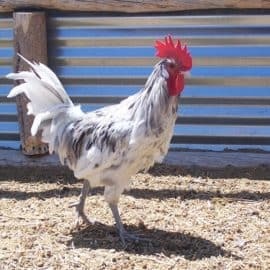 A free-range chicken generally makes a sport of out hunting down and happily devouring any sort of moving object it can find–including moths, grasshoppers, grubs, larvae, worms, and even the occasional mouse or frog. It’s a great way to pass time and an important source of protein for their diet. 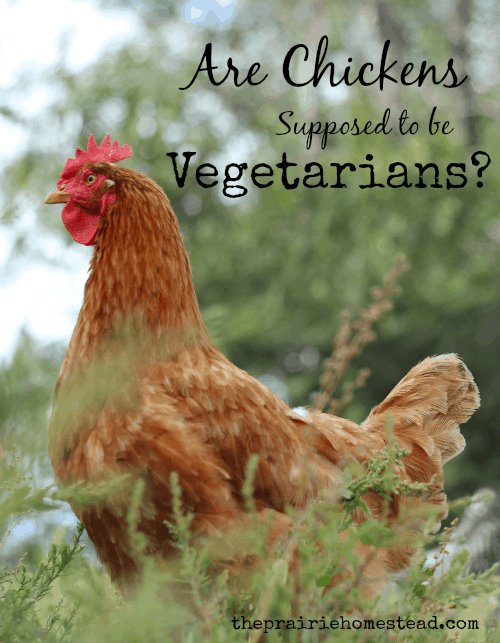 So if chickens are most assuredly omnivores by nature, when did all this buzz over “vegetarian chickens” start? It all began when folks became aware that many animals raised in commercial operations were being fed processed feeds containing animal-byproducts as a source of protein. Now at first glance, that doesn’t sound too bad. But when you understand just what those animal by-products are, that’s when things get gross. The “animal by-products” that pop up in ingredient lists in various animal feeds can include blood, same-species meat, feathers, rendered road kill, and euthanized dogs and cats (1). Not only does that seriously offend my common sense, but it was also discovered that feeding certain parts of cows back to cows can result in bovine spongiform encephalopathy, aka “Mad Cow Disease (2).” And that’s a very big problem. Cows weren’t made to eat other cows. Or dogs and cats for that matter. Cows were made to eat grass. So laws started to change and producers and consumers alike started watching more closely what animals were eating. And if most people had to choose, eggs from chickens fed a vegetarian diet sound much better than eggs from chickens fed slaughterhouse waste (or worse). A carton of eggs labeled “vegetarian” means that the chicken was fed a diet free of animal by-products. In addition, all USDA Certified Organic eggs must come from chickens fed a completely vegetarian diet consisting of certified organic grains (3). 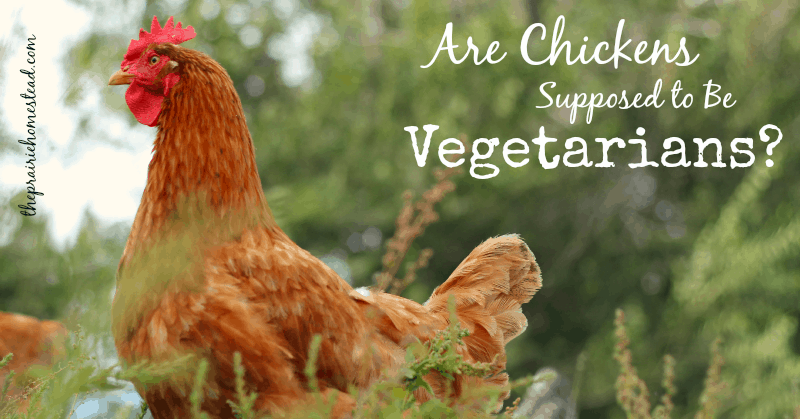 That sounds fine and dandy until you realize that a chicken in its natural environment is NOT going to be vegetarian and that “vegetarian” eggs probably come from chickens that are not allowed to free-range. By default, the diet of a honest-to-goodness “free-range” chicken will most definitely include creepy-crawlies of all kinds. So while it’s nice to know that commercially-raised chickens fed a vegetarian diet aren’t eating rendered dogs and cats for lunch, that label doesn’t necessarily mean that they are a whole lot better off than their other commercially-raised buddies. And I personally think that chickens need meat bits and insects in their diet if we are sticking with the “natural” way of doing things. And eggs from chickens raised in a pastured set-up are a whole lot healthier for you anyway. The world of egg labeling is pretty sketchy and not always what it seems… For example, the label “cage-free” sounds pretty good, until you realize that, by law, all that has to mean is that they can wander around in a crowded chicken house. It doesn’t mean they necessarily have access to the outside or are running around in lush green pastures eating grasshoppers. If you want to dig deeper into the confusing world of egg labels, check out this post from The Rising Spoon. So What’s an Egg-Lover to Do? 1. Raise Your Own Chickens. If you can’t have your own chickens, there’s a good chance you have a friend who does keep a flock of happy hens. If your friends haven’t jumped onto the chicken bandwagon yet, seek out families or farmers selling eggs at your local farmer’s markets. And reputable farmers will be more than happy to chat with you about how their chickens are raised and what they are fed. If you aren’t having any luck finding local chicken producers, look for eggs that say “pastured” on the label. Now as we know, labels don’t always mean what they say and they aren’t any governing regulations for the term “pastured” yet. 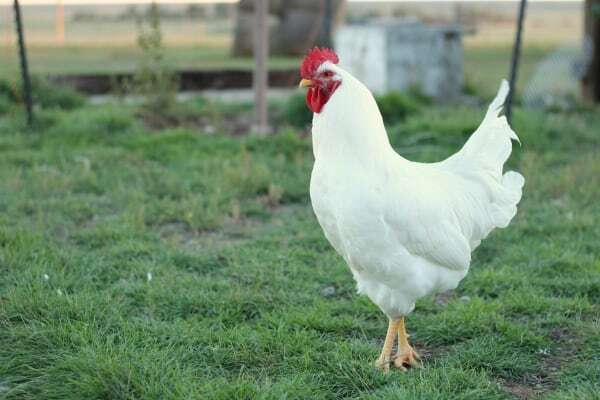 But if the the company is reputable, pastured eggs usually come from birds allowed to graze on grass and whatever bugs might be hanging out in that grass. And that’s a good thing. Thank you for that. I too just shake my head when I see advertising for vegetarian fed hens. 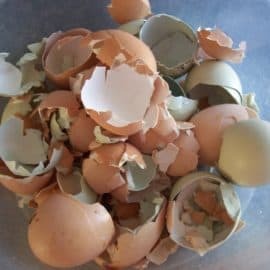 I would LOVE to mix my own feed for my hens! As of right now, I use the standard chicken feed from the co-op, but maybe this spring I’ll venture into my own stuff. And raising grubs? That is so cool. What do you all think of feeding shrimp shells to chickens? I just saw Harvey Ussery this past weekend at the VABF conference. He gave a great workshop on what types of food to grow.raise so that you can feed your chickens without having to buy any commercial stuff. It was a really great talk and I can’t wait until we have more than a half acre to play with! Amen to that! We have our own hens for eggs. I know the cost is high, but not so high it isn’t comparable in price. I am a stickler for no soy and no gmo as well. Funny you mention bugs; I am considering raising mealworms for my flocks. Easier than other options and a whole lot cheaper. I have a mixed flock of chickens and guinea fowl. The hens (thankfully) tend to keep the guineas from wandering off into the forrest (sometimes). I love watching them all out ‘doing their thing’ especially when one digs up a large worm, grub or catches a mouse. The whole flock will run over to see who got what and often a hot pursuit will ensue as one of the others tries to steal the prize. If it’s something especially tasty the chase can go on for almost a half hour. I think I could rent some of my birds out to an excavation company after having to fill in some of the holes they’ve dug. BTW the guineas love to eat ticks. YES!!! There are few things on a farm as vicious as a chicken hunting down a grasshopper, or something a bit larger. They love their meat! Just wanted to add my two cents here. As a city dweller in WNY whose farmer’s market is gone in the winter, organic vegetarian fed chicken eggs are the best we can do sometimes. 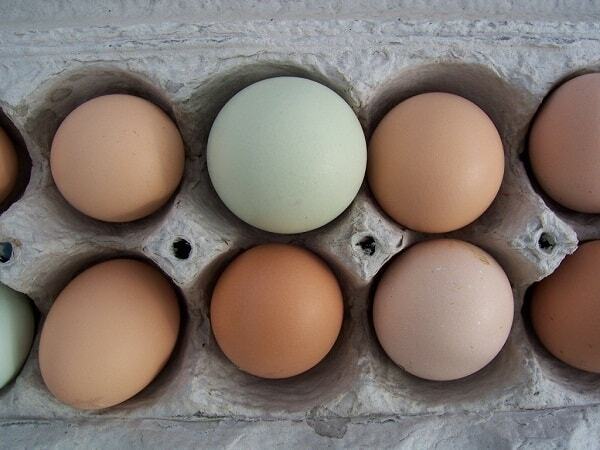 When they’re available at the market, we sure do stock up on the fresh from the farm eggs, and they’re so much better! Given the alternative- eggs from chickens fed “animal by-products”- we’ll do the best we can with what’s available! That’s a good point Sarah. Sometimes you just gotta do the best you can do! I’ve also been shaking my head at the “vegetarian chicken” claims. Our chickens love bugs, worms, etc. Last summer, my husband killed a snake in their yard. The tail (still moving) fell to the ground, and the chickens devoured it! That’s funny you said that! I had the same thing happen. Walked out to let the chickens out of the pens and they all had one hen cornered. They were going nuts! Well it had a Garner snake twisting around in it’s mouth! I give my hens all kinds of fruit and veggies figur8ng they get their own meat so my eggs are so rich and delicious! Yummy! That’s so they can still have a warm fuzzy for keeping chickens in a cage all it’s life, never letting them out, and turning a light on so they will lay three eggs a day. Mean way of doing business in my opinion. Believe it or not, I just commented about this very thing in a local FB group a couple weeks ago, so I laughed when I saw this in my email. I saw, for the first time, a carton with that label and asked out loud, “Why does it matter that our chickens are vegetarian now?” I’ll admit I was unaware that the feeding animals other animals trend had extended to chickens, but I know that chickens are supposed to eat bugs and things, so this particular selling point wasn’t actually desirable. I’ve been giving some thought to the eggs I purchase. I purchase cage-free eggs, but I’ve also seen a show with chickens crammed into a building pumped full of hormones to the point that their little legs couldn’t hold up their large breasts and bodies. Technically … they were cage-free. Having said that, the egg cartons I purchase states, something like “free range, raised without antibiotics or growth hormones, in a humane, cage free environment with organic vegetarian feed.” There’s some sort of fine print though, and it does state “vegetarian feed.” I do wonder what their cage-free environment looks like. I’ve seen a neighbor with eggs for sale. Maybe I can check it out and see what she feeds her girls. When I was growing up, all free-range chickens ate worms and bugs scratched from the ground. Thank you for this and to be honest, it wasn’t something I ever thought of before (and I feel a little silly for not thinking about it). Here in Nova Scotia, Canada getting a lot of certified organic food is not always easy (or affordable) but it’s pretty easy to find “free range” chickens and eggs. After reading this, it’s probably the better alternative anyway as most of our farms that sell free range here are pretty much “organic” anyway, even if they don’t have the costly certification to go with it. I love the smaller farms – you get to speak right to the farmer and find out everything you need to know. I honestly had no idea that there was such a thing as vegetarian chickens or any special type of special marketing for vegetarian chicken eggs. I really need to get out more. The view from here is that chickens are only one step beneath pigs when it to eating gross stuff. Can’t tell you the times I’ve had to kick away a bunch of hens that were tag teaming the backside of some poor ewe or cow that had just delivered a lamb or calf. Apparently fresh and still attached placentas are a real chicken treat. Surely the notion of vegetarian chickens must have from folks that have never watched a free range chicken at work. Seems big ag industrial food knows more about the sensibilities of city people and not a thing about chickens. Or maybe worse, they know about chickens but just don’t care. Now I want to know whether cows should be fed protein, and if so, what’s a good protein source? When my neighbor started feeding his heifers protein this winter, I started thinking about that. And now that I know that there could be euthanized pets, other cattle, or roadkill in that protein feed… Ugh! 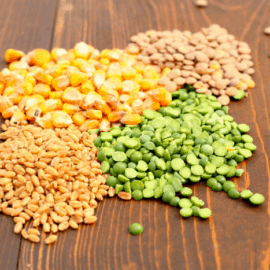 Some cattle producers offer their cattle additional protein sources, but many of those are derived from soy or cottonseed oil. Our cattle are grass-fed, so they graze during the summer and we feed hay in the winter. And yes, the ebook is being formatted for print as we speak! Oh yeah, chickens LOVE non-veggie foods. I’ve seen mine eat snakes. And I once caught the entire flock fighting over a rabbit that an owl had killed and left in the chicken yard. They tore it out of my grip twice as I attempted to carry it off to throw away. Silly chickens. What about Free-range chicken eggs. Does that label mean the chickens are not enclosed in a building and eat a normal diet with insects bad worms included? Unfortunately, from what I’ve read, it appears that the “free-range” label is rather misleading. 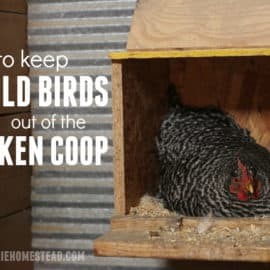 As long as the chickens have some sort of open door to their enclosure, they are considered “free-range.” So it’s still a far cry from a true pastured bird. Thank you for a great article. I couldn’t believe the difference in free run eggs and store bought the first time that we had them. So, we started to raise our own chickens and from there have worked on becoming more and more self-sufficient. I was at a chain restaurant a few months ago and they advertised their “vegetarian” chicken. I embarrassed poor hubby by ranting for a good twenty minutes on this. Our favorite hen Scrappy (RIP) killed and ate – singlehandedly – a 6 inch lizard. Sometimes for treat time, i cut up grassfed beef – they go crazy for it – the video is hilarious. God I love my chickens – best entertainment ever – and stress reliever. I love your blog, thank you for sharing your knowledge! Someday I will start milking my goats and picking eggs and and and… Or let my 4 kids do those fun farm chores! Just wanted to share my experience at a lodge in Tanzania… We were eating chicken lunch on an outdoor sitting, and there were chickens roaming around us looking for scraps… I accidently dropped some chicken on the ground, and chickens came for it and ate it up. I was so confused to witness this same species eating, and thought twice about the chicken I was eating…! When I am at the grocery store, I buy the vegetarian fed ones… I have been thinking many, many times about raising chickens… I think this has to be done, along with gardens… My kids will learn the proper way of life and skills. Thanks for your blog. I will learn a lot from you. Thanks for this article! I thought my chickens were crazy after a mouse got in the pen, a hen caught it, which made everybody else want it too. After being chased around she swallowed it whole so they couldn’t get it! I had no idea that chicks would eat mice. My main worry was please lets not have mouse eggs???????????????? Know what’s creepy gross? They love snakes too! Oh yes, they certainly do! I have been contemplating getting my own chickens and letting them have at my grub invested lawn. The only draw back I have is that it would be fairly expensive to put a decent fence up. We haven’t had too many coyote issues–raccoon and foxes are more of a concern for us. But in the daytime, our dogs and constant outside activity seem to deter them. “Vegetarian” just means the chickens were fed feed by the farmer that does not contain animal by- products, obviously they eat bugs and other things on their own but the farmer isn’t cramming bone meal, dried blood and meats from slaaughter houses in their beaks. You would be suprised at how many chicken feeds contain this stuff in them! I’m pleased with the day-time roaming and bug eating, but I don’t know anything about the “chicken scratch, egg maker pellets, cracked corn”…I wonder how much of their diet is made of that stuff, and if there’s any chance it’s close to GMO-free/organic feed. She said she didn’t know, but it came from Powell Feed store in Siloam Springs, AR ( http://www.powellfeedstores.com/ ). Thanks for any help/info/advice on the subject! That sounds like a pretty typical chicken diet. It’s probably not “perfect” as far as GMOs go, but still better than what you’d get at the grocery store I’m betting.